So colorful, isn't it? In my quest to eat more fish (let's hear it for those omega-3 fatty acids! ), I've forced myself to search for quick & tasty recipes online - from recipe collection websites like My Recipes, to my good old Google Reader. I must say, I've been rather successful! The easy tilapia recipe that I shared last week turned out to be a hit, but I thought it would be. I already knew that I liked tilapia, so I wasn't branching out of my comfort zone. However, I did with this one: Cod with Roasted Corn & Peppers. The original recipe calls for grouper, but they suggest "other moderately firm fish" like cod, tile fish or sea bass. Luckily, my Trader Joe's had cod fillets, so cod it was! Using pre-cut fillets saved me a lot of time. 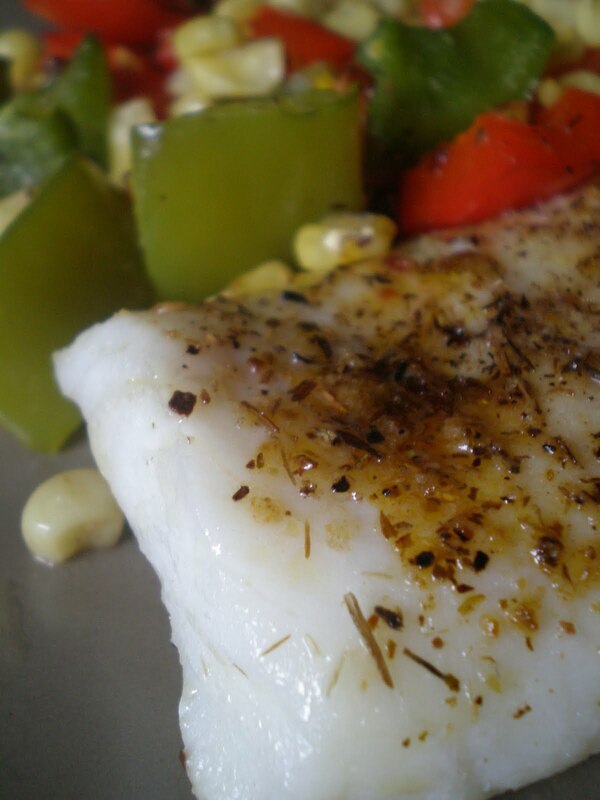 The roasted corn and peppers turned out to be such a great side dish to the cod. The smell while it was roasting in the oven was just fantastic. The best part about this recipe is that you use a cutting board, knife and a roasting pan. That's IT! Hardly any dirty dishes - love! Heat the oven to 450°. In a large roasting pan, combine the red and green bell peppers, the corn, 1 tablespoon of the oil, and 1/4 teaspoon each of the salt, pepper, and thyme. Roast in the oven until the corn and peppers start to brown, about 12 minutes, stirring twice. Rub the remaining tablespoon oil over both sides of the fish. Sprinkle the fish with the remaining 1/4 teaspoon each salt, pepper, and thyme. Remove the roasting pan from the oven and push the corn-and-pepper mixture to the sides of the pan. Put the fish in the center of the pan, skin-side down, and cook until just done, about 15 minutes for 1-inch-thick fillets. 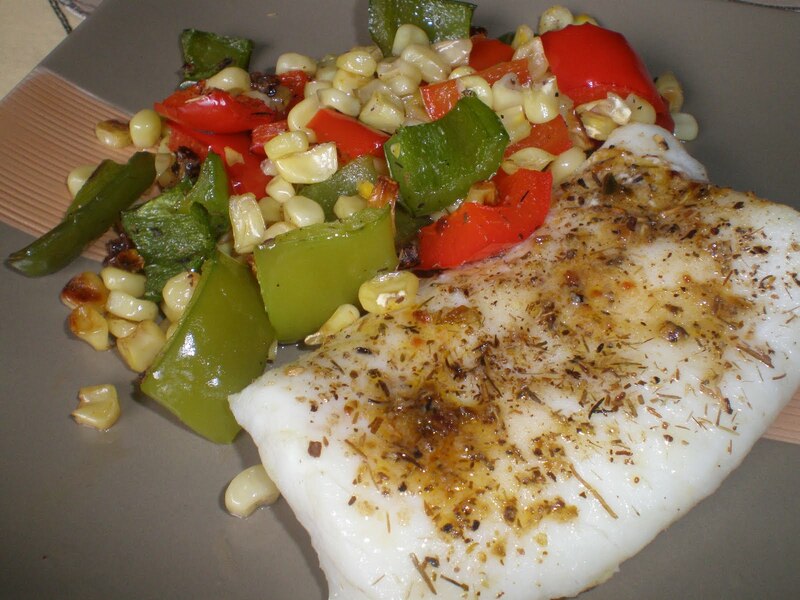 Serve the fish with the corn and peppers. Test-Kitchen Tip from Food & Wine: If using frozen corn kernels, let them defrost if you can; it only takes a few minutes. Measure the corn first thing and it will be defrosted by the time you're ready for it. Pat the corn dry with a paper towel after defrosting so that the excess moisture won't get in the way during cooking and make browning impossible. Hmm..mm...I am loving how you make this dish looks so simple and scrumptious as the same time. What a healthy looking meal! Mouthwatering... yumm... have a nice day. wow, your pics look amazing! glad I found your blog! nice to meet you and have a great day! This looks delish!The cod looks so succulent!